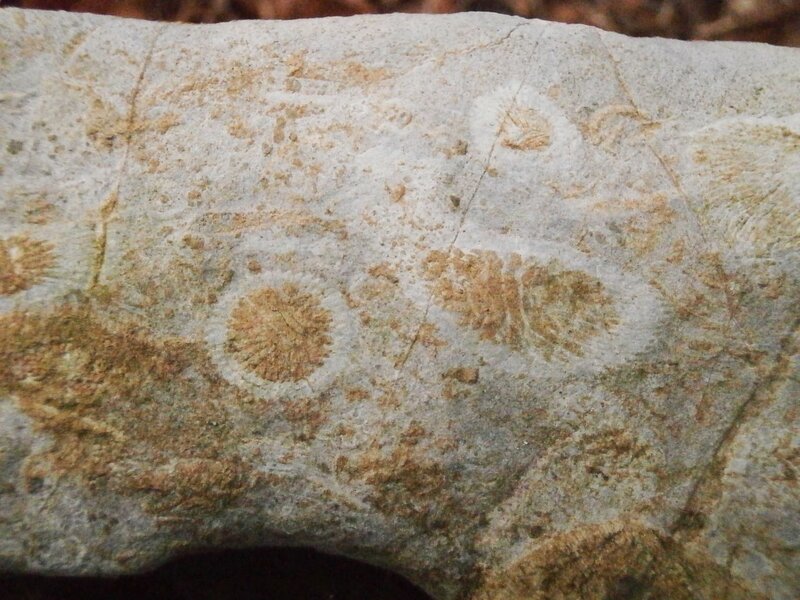 As there are some polished fossil-rock specimens from this formation in the Christmas auction, I would like to present some background info with (mostly) some field photographs, so I have put this in “Fossil Hunting Trips”. 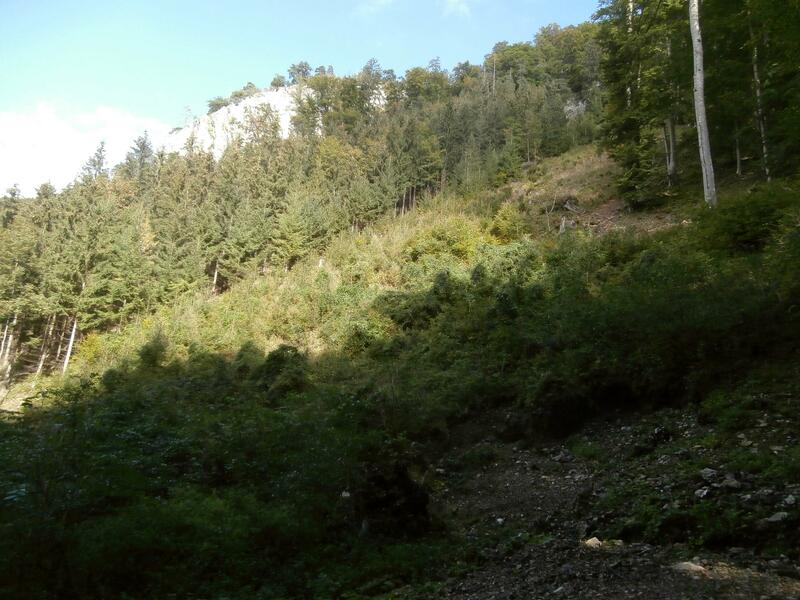 The Palaeozoic of Graz is a thrust sheet within the Eastern Alps, composed of Silurian to Pennsylvanian sediments. It consists of three separate nappes, the most fossiliferous formation is the Plabutsch-formation within the Rannach nappe. 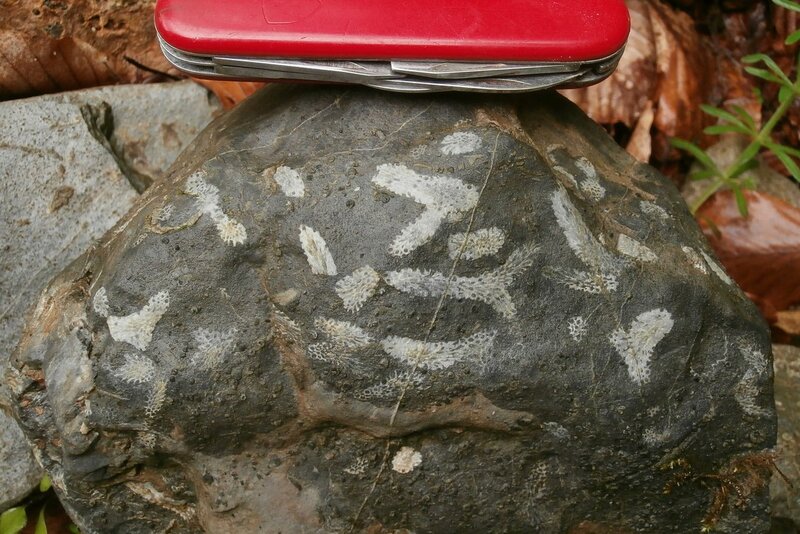 This Devonian formation is of Eifelian age (ca. 395 Ma), about 100 m thick and mostly made up of a very dark, gray-blueish to black, fine-grained, thickly bedded limestone. Superficially, it weathers to a medium to light grey color. 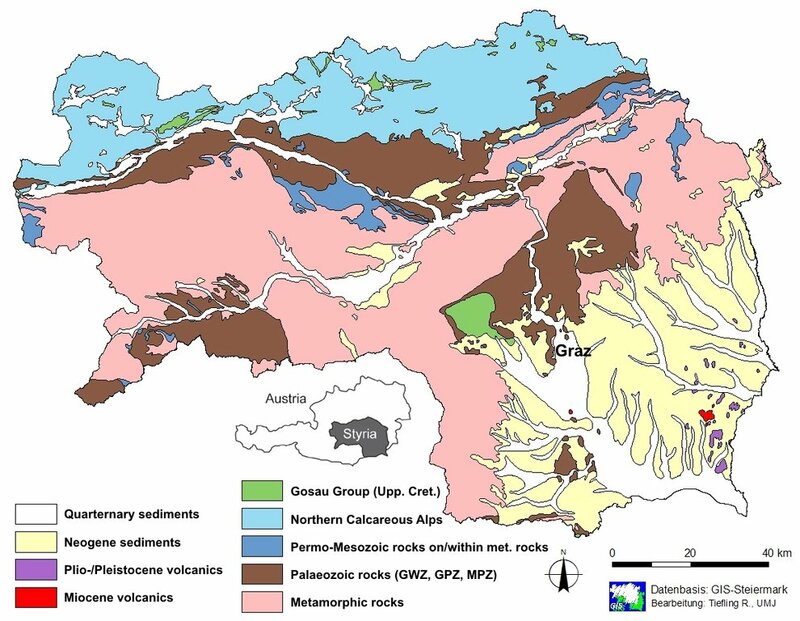 Geological map of Styria with the Palaeozoic of Graz situated north of Graz. 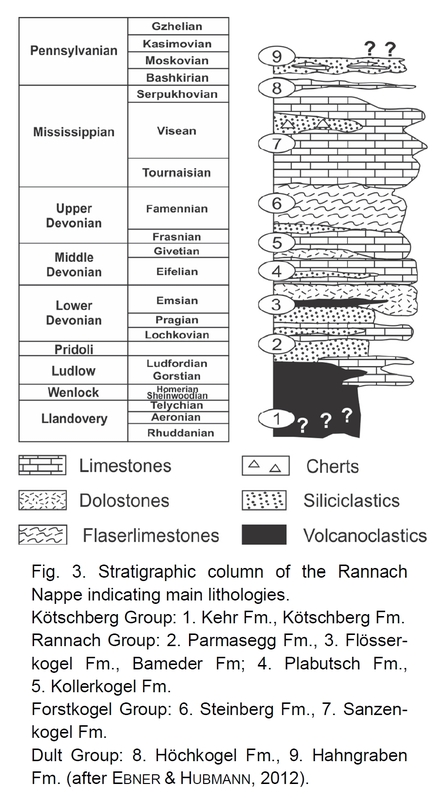 Stratigraphic column of the Rannach nappe of the Palaeozoic of Graz, Plabutsch-formation is Nr. 4. From Hubmann & Gross, 2015. Thicknesses of formations are not to scale! The Plabutsch-formation crops out at various places to the west and north of Graz and more than 100 fossil sites are known within this formation. 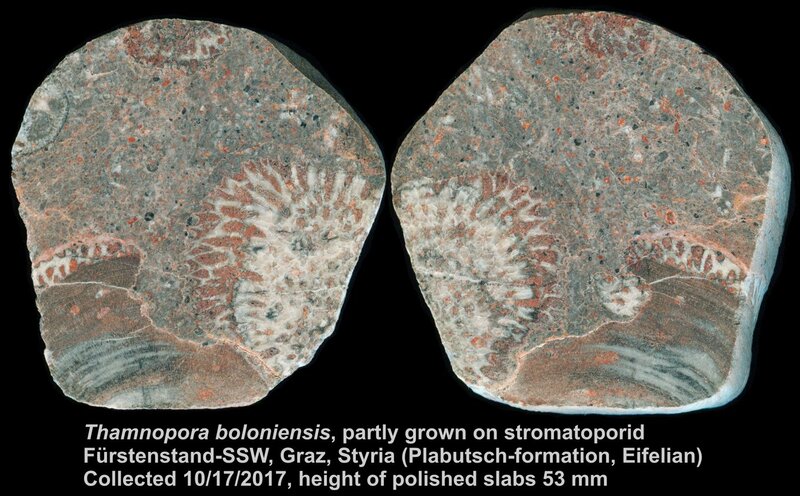 The most abundant fossils are corals, brachiopods, stromatoporids and crinoid fragments. 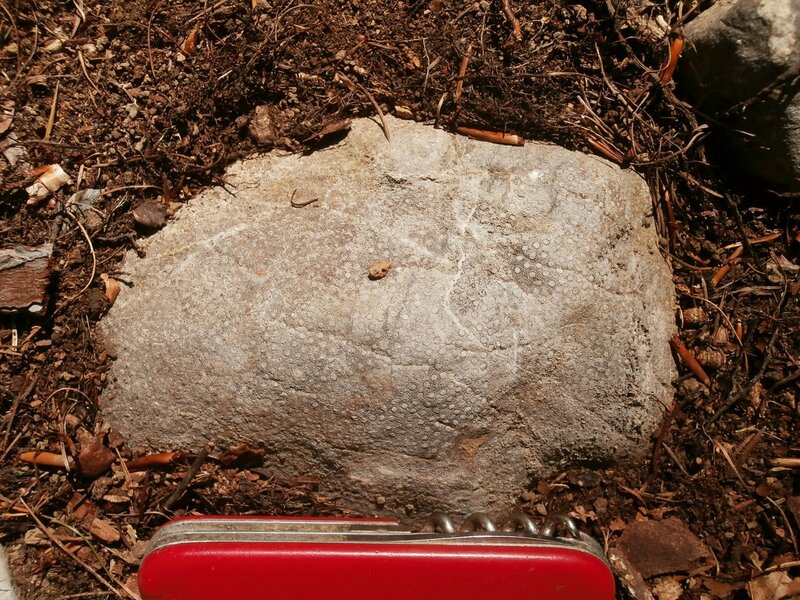 Other fossils like gastropods, bivalves or trilo-bits are very rare. Another Favosites styriacus, north of Fürstenstand Mt. 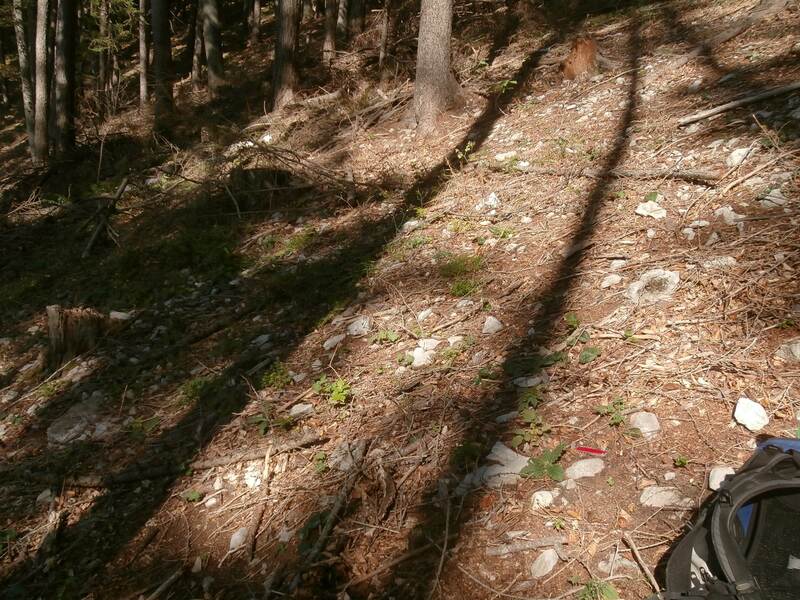 (754 m), northwest of Graz, photo 10/30/2015, not in collection. Tabulae are very well visible, weathering is usually your friend there! Now to the former namesake of the Plabutsch-formation. 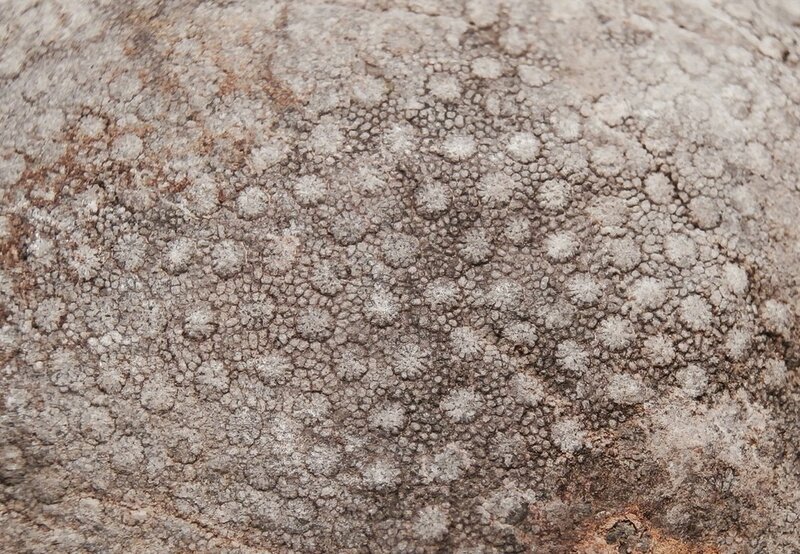 Until 2003, it was named “Barrandei-Kalk” or “Barrandei-Schichten” after the massive tabulate coral Heliolites barrandei, now known as Pachycanalicula barrandei. Field situation southwest of Fürstenstand Mt., northwest of Graz. 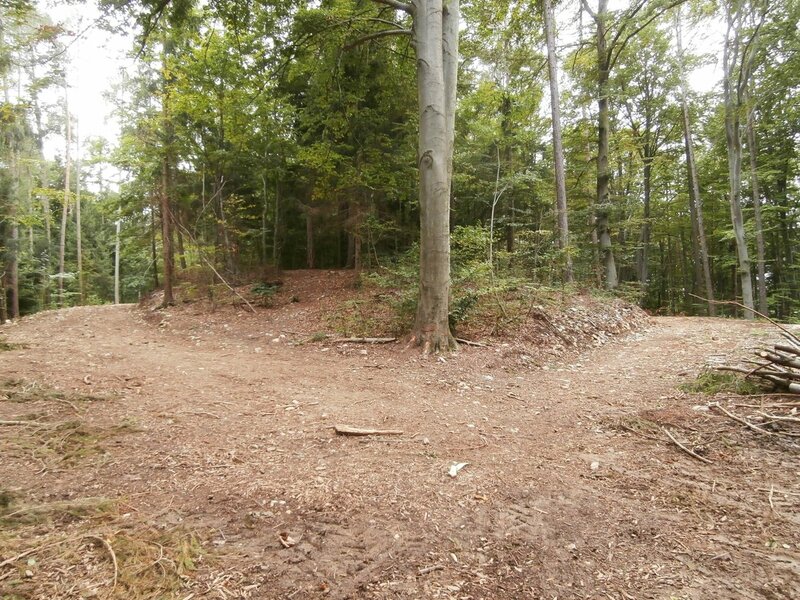 Also a wooded area with some loose rocks. 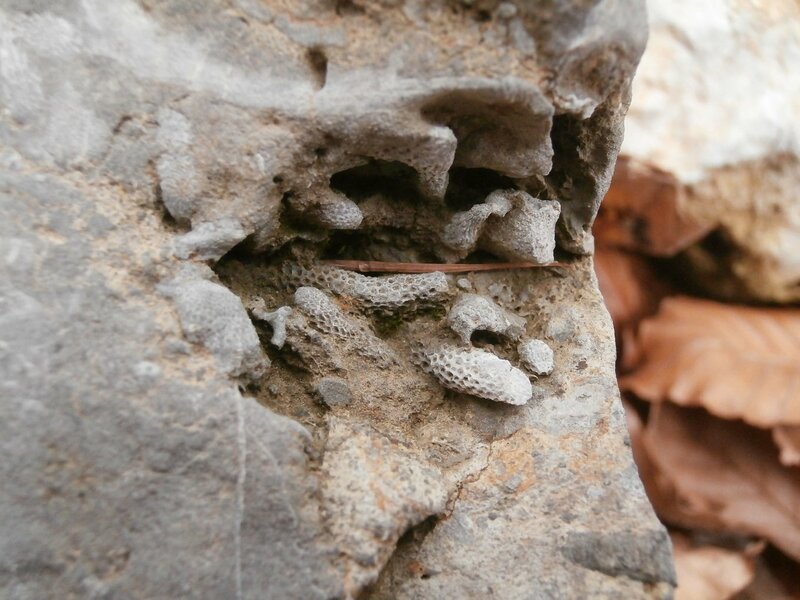 Near the pocket knife, amongst all the fossiliferous rocks, a nice Pachycanalicula barrandei. Photos 08/29/2018, Col-Nr. 3415. And a 27 mm wide detail of the same specimen. The heliolitid corals have, in contrast to favositids, a very well developed coenosteum between the individual corallites. To be continued, maybe tomorrow. Very nice report so far! I especially like the Pachycanalicula. Excellent post, thus far. Nice maps, location photos and beautiful specimens. Puts those lovely auction specimens nicely into context. Beside the massive tabulate coral colonies, there are also abundant branch-like tabulates with strongly varying diameter of the branches. The largest of these is Thamnopora boloniensis, with a thickness of the branches ranging from 1 cm to 2.5 cm. 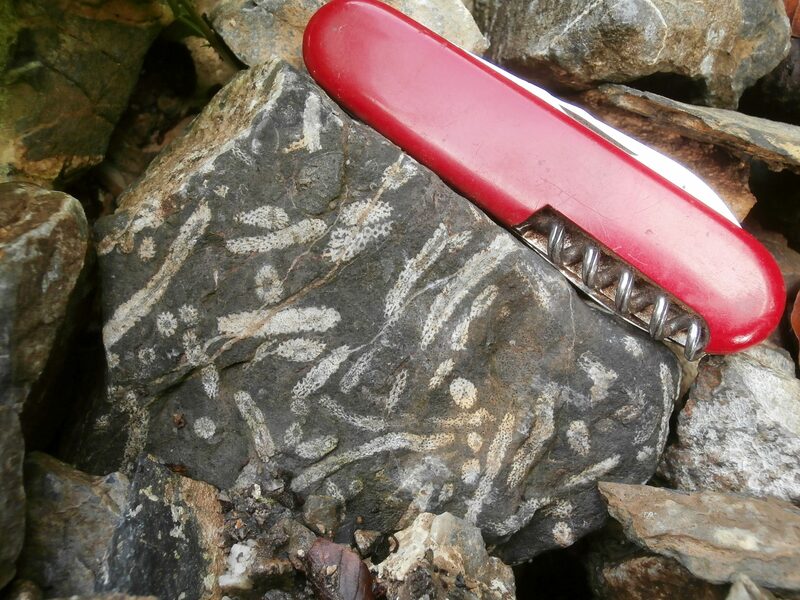 This species does not occur everywhere in the Plabutsch-formation, only in certain spots, but than in large amounts. 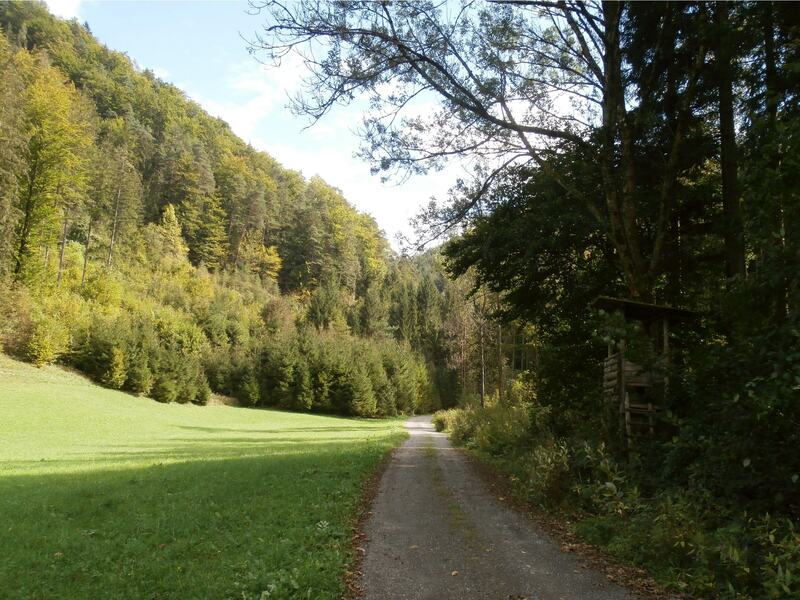 One spot is at Ölberg west of Graz. 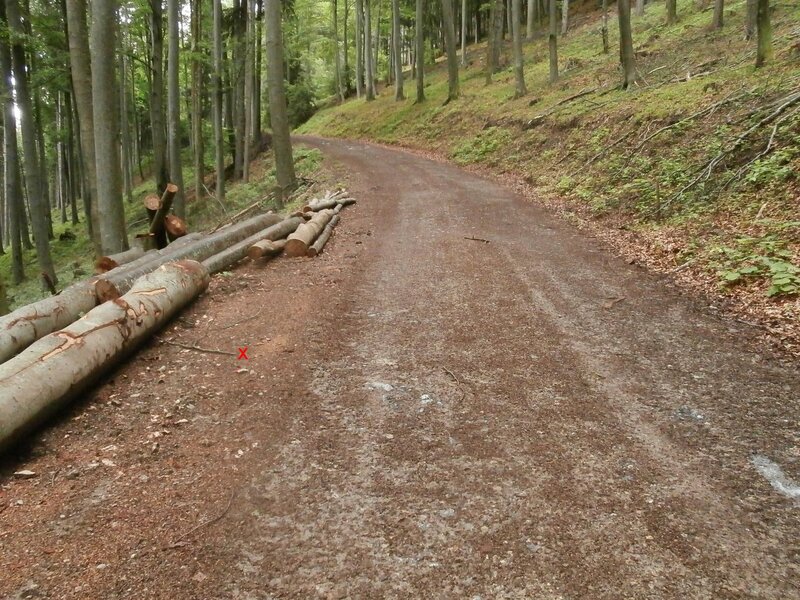 This fossil site has long been known, but the recent construction of forest roads was not that bad at all. 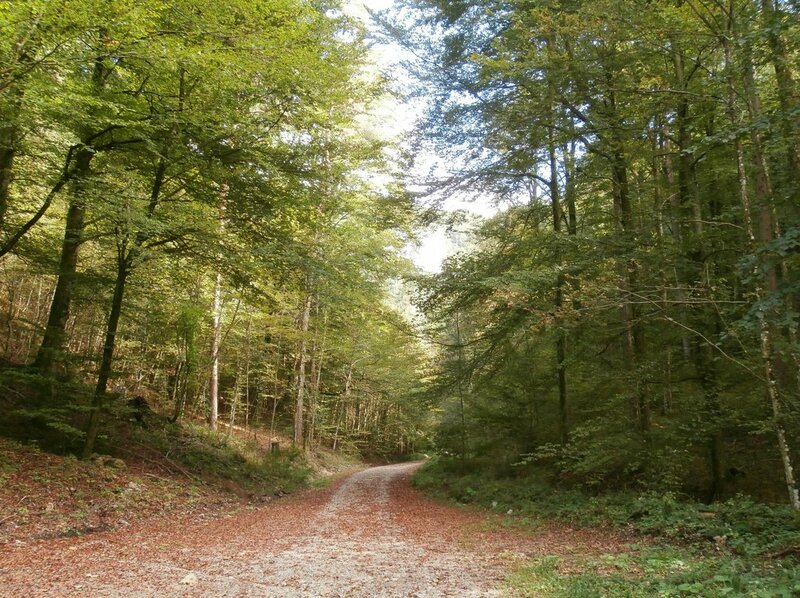 This is an overview of the site, fossils can be found in the slopes of both roads and in the forest above, photo 09/07/2017. 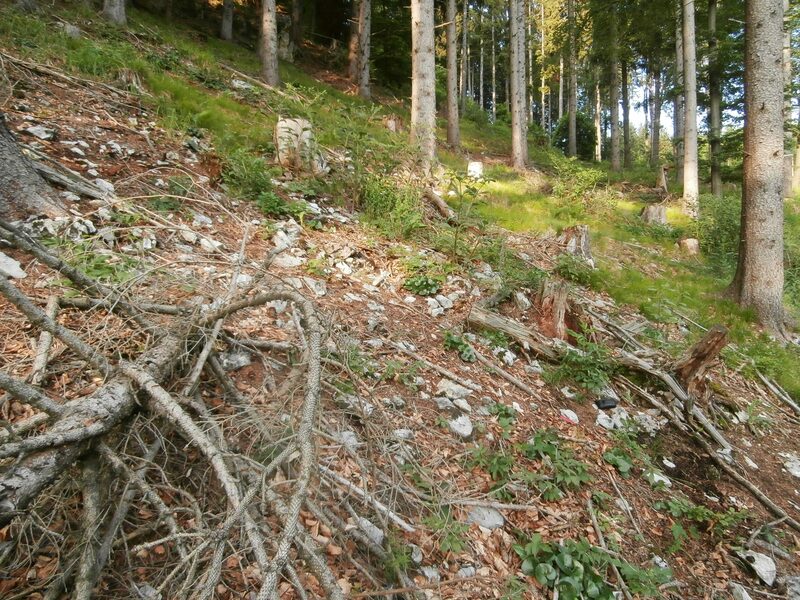 A well preserved specimen of T. boloniensis in the slope of the right road, unfortunately a little bit scratched, photo 09/07/2017, Col-Nr. 3523. And another one from southwest of Fürstenstand, that’s the more typical appearance of this species. Photo 08/29/2017. And one polished T. boloniensis in association with stromatoporids. Red isn´t a usual color in these rocks, but gives a nice contrast. Usually, everything is very dark and very grey (see auction). 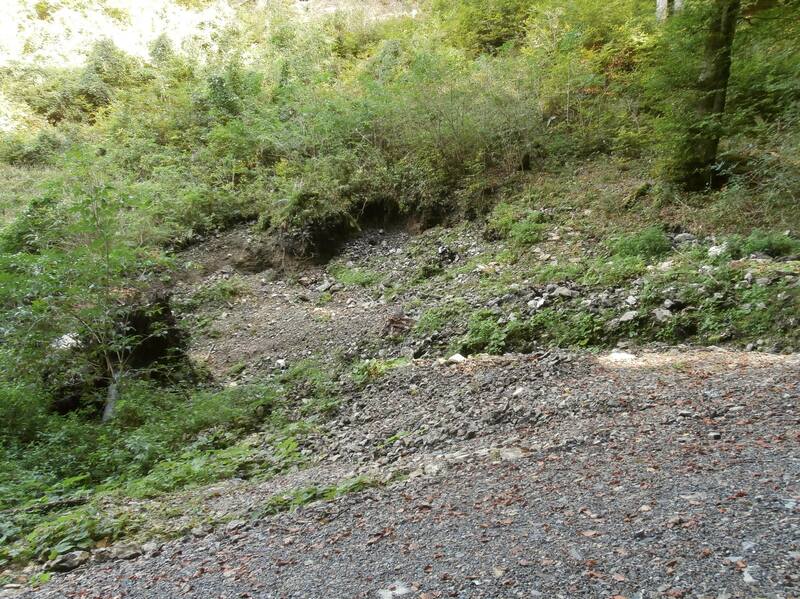 For some smaller Thamnopora species, we are going back to Hohe Rannach Mt., to a creek on its northern slope. Some green there, isn´t it? But there is also a tree ball, that´s good! Photo 05/21/2018. …is a rather nice Thamnopora reticulata with good contrast (its wet, so contrast is even better). 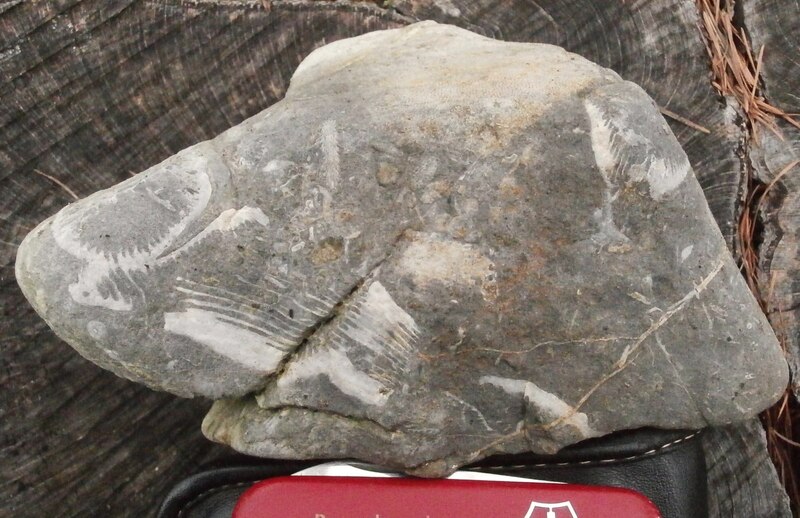 Fossils are very abundant at many spots, but fossils with good contrast and already cleaned by mother nature such as this one are relatively sparse. Photo 05/21/2018, Col.-Nr. 4089. A few months later, we are going smaller again! First a few pics from the hike to the same spot as above (a creek north of Hohe Rannach Mt. 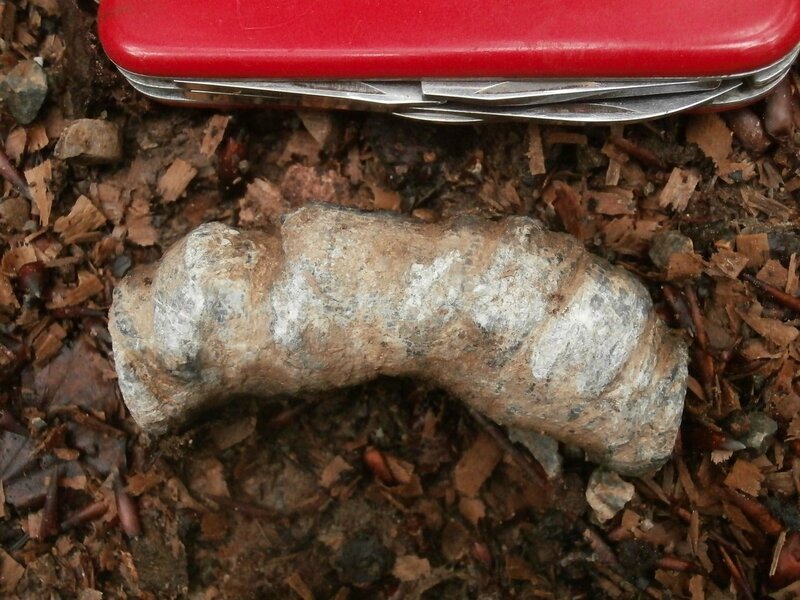 ), about 1 km long. Photos from 09/23/2018. View back, still very near the car. 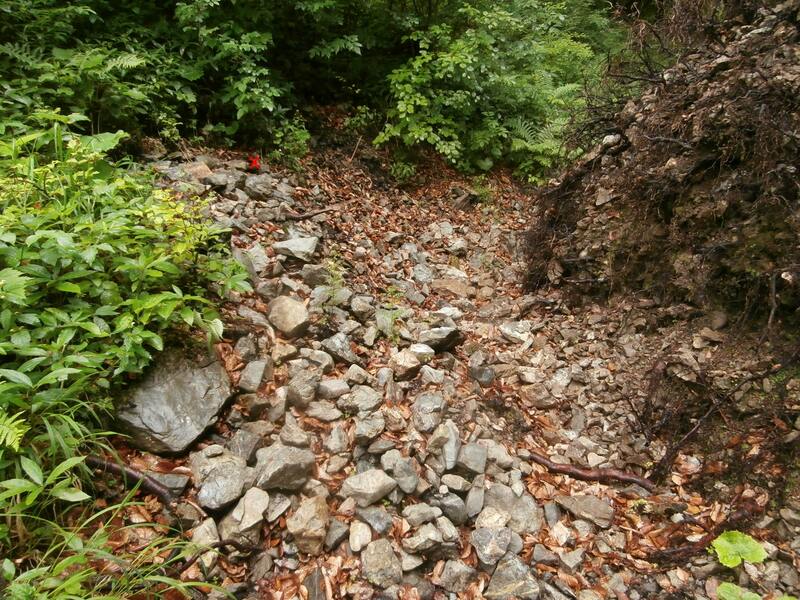 Yes, a few months ago, some of the scree near the tree ball was overturned during forest road servive, exposing fresh rocks. Photo 09/23/2018. And this was not really bad at all! A few Striatopora? suessi with good contrast and already cleaned were waiting for me. Why the ?. Local experts are not sure, to which genus this species belong. Col.-Nr. 4226. 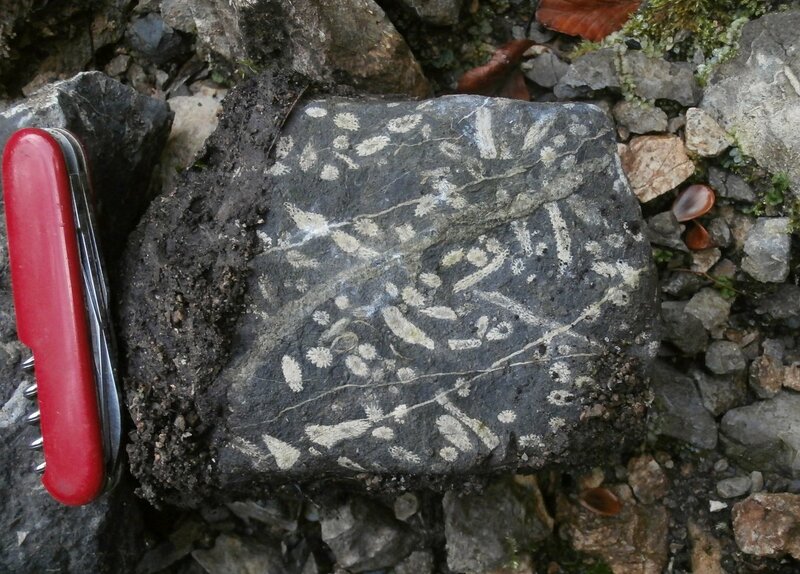 And another specimen of this species from the same spot, more or less in-situ in the scree. Col.-Nr. 4227. All of the fossils I have shown so far are only 2D. 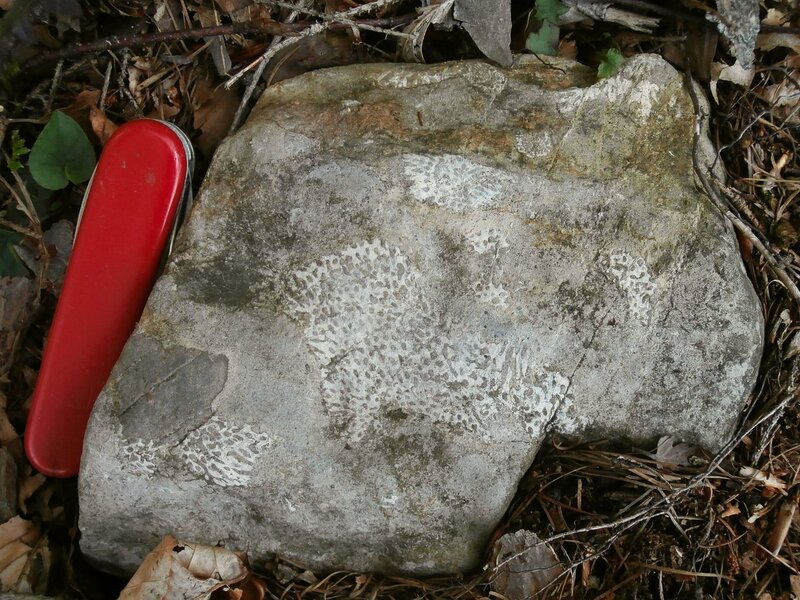 Very rarely, especially if there are some siliciclastic layers and pods within the limestone, 3D specimens may occur. Nowadays, after about 150 years of collecting, they seem to be very rare, especially if you collect only occasionally in this formation as I do. A local expert, collecting there for about 30 years very regularly, has a very impressive collection of such 3D specimens. But sometimes I am also lucky. 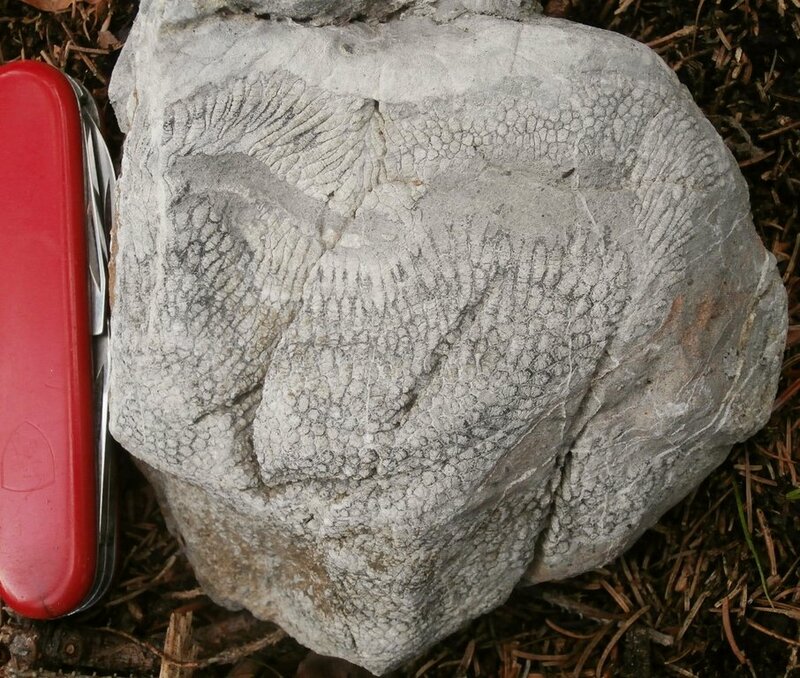 A relatively large block of fossiliferous limestone with a cavity filled with short branches of Striatopora? suessi (I think). It´s from north of Fürstenstand, photo taken in the field, 02/26/2016, field of view is 6 cm. Looks like a beautiful place and a lot of fantastic fossils. Great report! Now to the rugose corals. Tens of species are described, most of them are solitary, few of them are colonial. 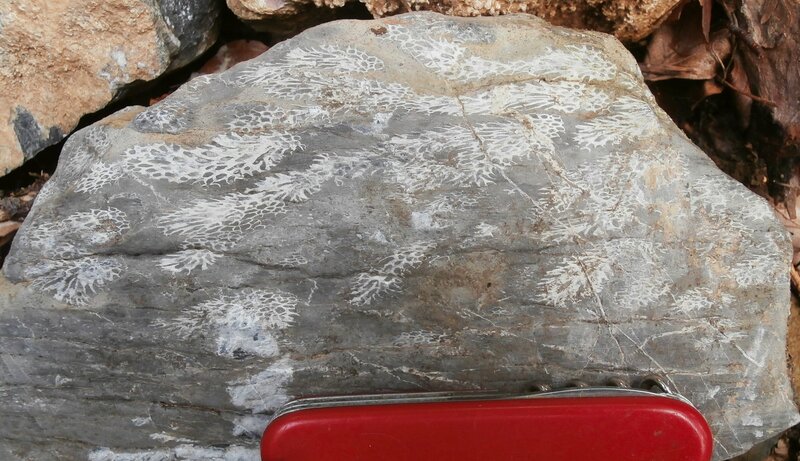 Unfortunately, I don’t have many field photos of these corals from the Plabutsch-formation, I will only show the two most abundant ones. 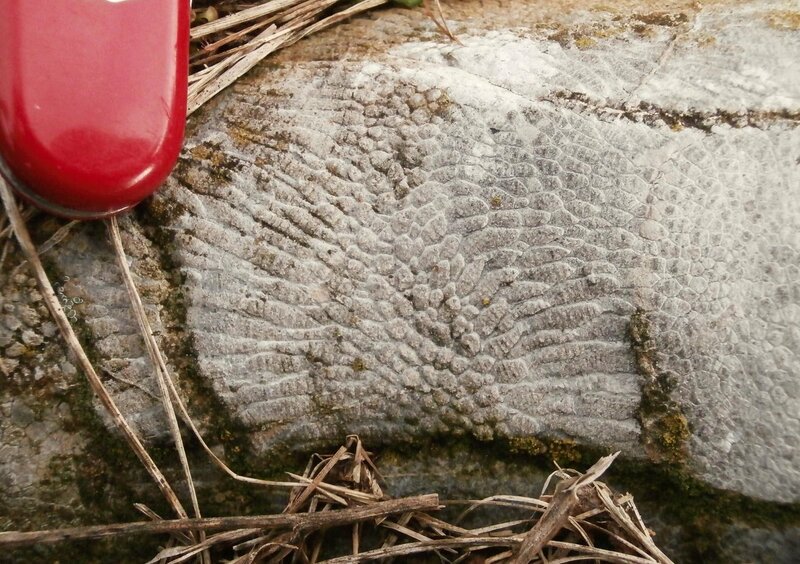 This is a poor photo of low-contrast coral cross sections from north of Fürstenstand. I think, these are Thamnophyllum stachei. Field of view 6 cm, photo 02/26/2016. And a specimen with various fragments of Zelophyllia cornuvaccinum, also from north of Fürstenstand. This species, also solitary, can have a diameter of up to 10 cm. Photo 02/26/2018. ..this rugose coral was hanging around. First I thought that’s a piece of (you know what), but it was indeed a fragment of a solitary coral without any matrix. Septa are visible at both ends, but it is not possible to determine even the genus - but it´s nice anyways. I have no idea how it get there! Now in collection with Nr. 4092. 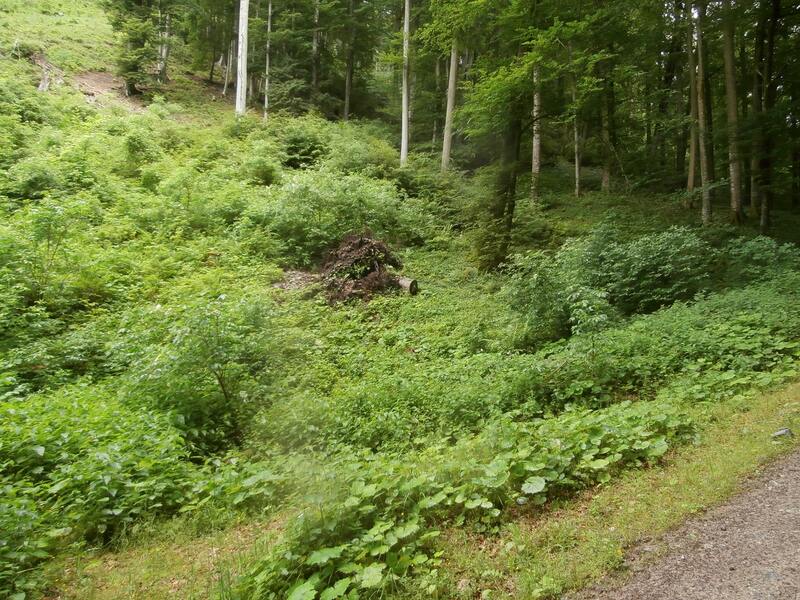 Now I am at the end of my two and half year long "fossil hunting trip" to the Plabutsch-formation. I would think with a transverse and a longitudinal section cut from a piece of that coral it should be possible to ID the genus and possibly the species. Fantastic travelogue with sharp data detailing. Thanks so much for sharing with nice pics. I love the 3D Striatopora? suessi and the Thamnopera-stromatoporid association piece - simply beautiful!!! Very nice report so far! Fantastic travelogue with sharp data detailing. Thank you very much for all your interest and appreciation! Yes, it could be possible. But the local expert is somewhat uncertain about that. He thinks, it is too strongly recrystallized (as far as can be seen at the broken ends). Yes, these polished slabs with so much red are really special for this formation. Usually, everthing is very dark grey... The association itself is not very uncommon, but always nice to find. And the scenery is stunning. I like them too, even in 2D. Thats usual case here . However, Morocco with Atlas mountains is also beautifull, but totally different. There are many, many nice places in this world. 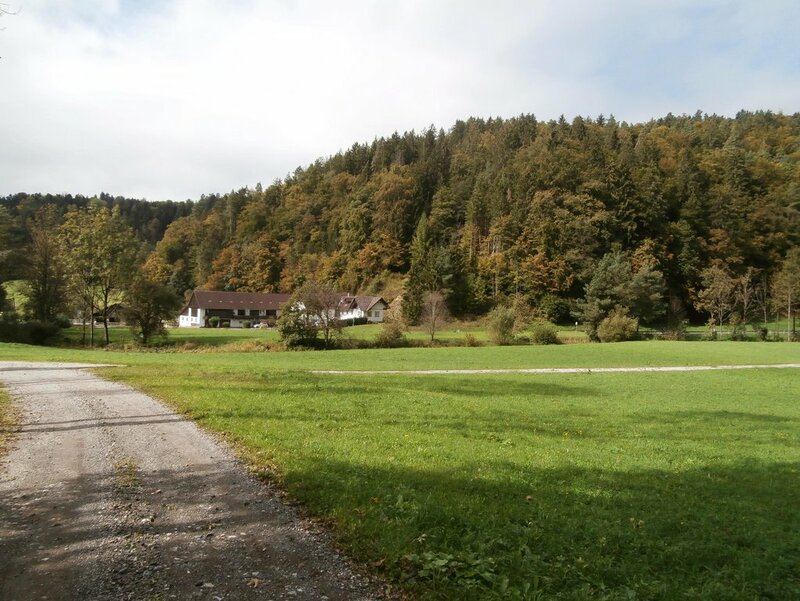 Maybe I will post my todays trip in a few days (after I have posted some more fossils from the Plabutsch-formation), with some more scenery: Houses, streets, freeway, chimneys... . Indeed, Morocco is very beautiful. And it is a beautiful world. Or at least those bits of it we haven't ruined yet. I agree with the others on everything - good photography of scenery and specimens, and nice fossils, esp. the 3D coral but the weathered pieces are also nice to find. No back-breaking 'chain gang' work excavating them, and no gluing together broken fragments, either, I assume? In your other thread about this location I was going to ask whether you had any exposures to find freshly exposed, unweathered fossils, but this thread answers that question. Correct, all of my specimens from the Plabusch-formation are just picked from the surface and sometimes a little bit cleaned with a soft brush, thats all. 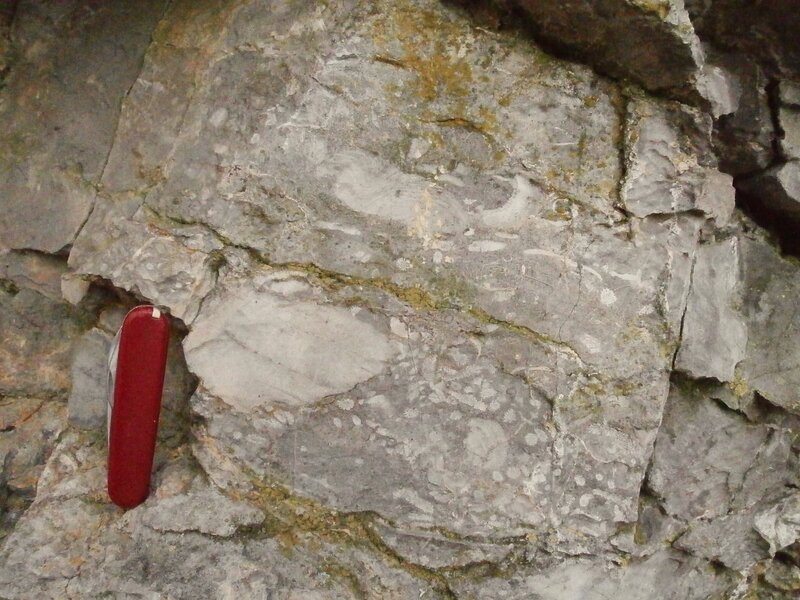 There are several outcrops with fossil in this formation, but the fossils are usualy also 2D. I have only a very poor pic of a typical outcrop, with some corals, brachs and stromatoporids, but you can get the feeling, I think. You are welcome, thanks for your appreciation!